Wagakki Band, an eight member group that fuses together traditional Japanese instruments and rock music, performed in Los Angeles last weekend for the first time in America at Anime Expo 2015’s Cool Japan Festival. Their members are Yuko Suzuhana (vocals), Kiyoshi Ibukuro (koto), Daisuke Kaminaga (shakuhachi), Beni Ninagawa (tsugaru shamisen), Kurona (wadaiko), Machiya (guitar), Asa (bass), and Wasabi (drums). They got their start covering VOCALOID songs on niconico and their cover of Senbonzakura has over 20 million views on YouTube. Recently, they have written original songs for the anime Samurai Warriors as well as the spin-off live-action web drama Attack on Titan: Hangeki no Noroshi. Vocaloidism got a chance to interview them last week. Is this everyone’s first time in America and what sort of things do you want to do here? But how about personally? What type of things do you want to do in America? Yuko: I’ve always loved American movies, so I have always wanted to live here. Daisuke: If possible, experience, I don’t quite remember what it is called…but a Native American teepee sauna. It’s a hot sauna type of ritual. Yuko: She doesn’t know it! Kiyoshi: I have always wanted to play live on stage in the States, so it’s great that I have an opportunity to do it this time. Wasabi: I would like to visit a Gold’s Gym and chat with the other trainees. Asa: There’s a Gold’s Gym here? Asa: I would also like to go to Gold’s Gym. How did Wagakki Band start? Why did you guys decide to collaborate and how did you decide on the members? Yuko: I was a shigin (recitation of traditional Japanese poems) performer and traditionally shigin is accompanied by the koto (harp) and the shakuhachi (flute). However, since it is a traditional form of performance, it’s not very well known even in Japan, especially among younger audiences. We wanted to do something different, so we started talking to our wonderful friends, the artists and performers, and asked them whether we could mix up traditional music and rock music to create something that even younger audiences in Japan would find interesting. And then we want to see if we could bring it out to the entire world. Why did you guys decide to start covering VOCALOID songs in the first place? Yuko: Well, VOCALOID songs are popular in Japan. There are these fast songs that would be quite difficult to play using traditional Japanese instruments. But because it’s difficult, it would be an impressive “wow factor” if we could pull it off. Asa: In fact, among VOCALOID and J-pop songs, there are quite a few songs in the style of traditional Japanese music, but those sounds are all computer generated instead of recorded from actual traditional instruments. Hence, we thought it would be interesting if we could pull it off with real instruments. Yuko: To be honest, there are many different computer-generated sounds we couldn’t really easily reproduce, but we chose, we dared, to produce those sounds with Japanese musical instruments. In Japan, there is a very popular video sharing site that plays VOCALOID songs and the individual players in our band started showing music videos through the video outlet. Your video “Senbonzakura” on YouTube has millions of views, many of these views are from Western viewers, how do you feel about foreigners listening to your music and discovering Japanese culture? Yuko: I feel really happy that we sorta became the window for the world’s audience to peek into the Japanese culture quite easily. And I’m glad to be part of it. Kiyoshi: Traditional Japanese musical instruments aren’t some things that people think of as “cool”, not even in Japan. However, by delivering them in a way that is “cool” to audiences both inside and outside Japan, we have been able to elevate these instruments to something that’s “cool” and I’m very happy about that. On Wagakki Band’s upcoming album “Yasou Emaki”, many of the songs are original songs. Who does most of the songwriting and how does the arrangement process go? Yuko: Actually most of all the band members create/write songs. In the past, Yuko, Asa, and Machiya were the main songwriters. But for this album, for example, Kurona wrote a song and its lyrics, and Kiyoshi wrote the words to another song, and as a result this led to an album rich in diversity. Our previous (VOCALOID cover) album was a compilation of songs written by many different artists, but for this album, there are also many different band members who wrote songs, so please look forward to seeing these different personalities and characters in this new album. Daisuke: In the last question, you also asked about the arrangement of the songs. Just like in the previous album, the members would consult the composer and the other members to create their own arrangements for their instruments. Kiyoshi: Los Angeles, very happy to be here. I would like to do it in New York as well. Yuko: America is such a big country, so there are quite a few places where we would like to play, so we would like to tour nationwide. Wagakki Band has many beautiful outfits, how long does it take to get ready and how do you guys coordinate what you’re wearing? Yuko: For example, my outfit—it’s the biggest piece—and surprisingly we always end up rushed for time and having to make it quickly. So about a month in advance, I go to talk to a designer and convey what I would like to do and designers will design and the same time the hair and makeup is planned, so all the production is run concurrently. Wasabi: The costume is… my body is the costume itself. For the question was how long has it taken to create this costume, it has taken about a year now. Kiyoshi: When is it going to be complete? Wasabi: I’ll reach peak condition in about 2 years. Wasabi: And the lettering in the back, each and every time is different. Yuko: Wasabi just took off his costume really quickly, he asked the designer to make it like that. Asa: I’d like to go to Gold’s Gym to make my “costume” better. Yuko: Maybe he’d be popular in the United States. Asa: People might be starting to think fans can meet him at the Gold’s Gym. What are your feelings before a performance, are you very nervous, very excited? Yuko: Depends if it’s TV or live stage, the tension is a bit different. Rather than being nervous, it’s more “exciting”. But of course, the most nerve wracking one would be a live performance on TV. Asa: Because Machiya has so much more experience than the rest of the band, he’s always calm, never nervous. Yuko: Beni keeps on playing up until the veeeeery beginning of the show, and I say “Don’t play it anymore!” And Wasabi always keeps playing on the drum pad. Kiyoshi: And Dai always plays something different from the set list. Yuko: Celtic music, he would play! Yuko: Kurona, rather than practicing taiko, he would practice shouting. Yuko: And that’s about it. If you could choose any VOCALOID song to cover, which would you choose? Or pop songs in general? Kiyoshi: You have to have to very strong to do that. Beni: It depends on how you feel about it. 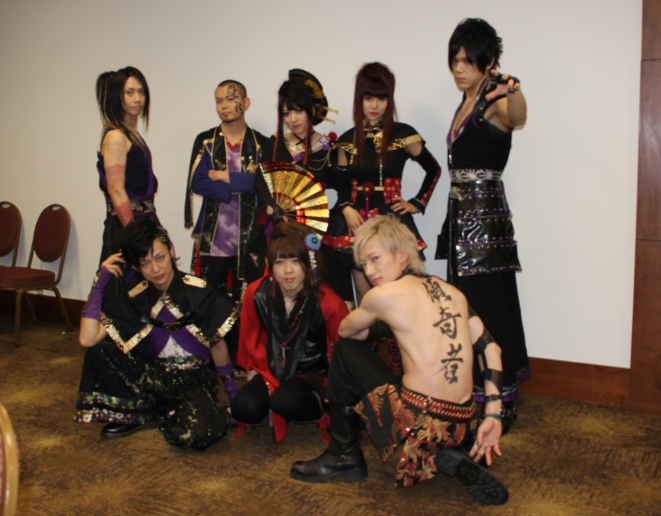 If you want to learn more about Wagakki Band, please visit their official site (http://wagakkiband.jp/) and Facebook page (https://www.facebook.com/WagakkiBand). They also have a global fan club called Yaeryu (http://global-fc.net/wgb/). We have other posts in the works regarding Cool Japan Festival featuring IA & Wagakki Band at Anime Expo, so stay tuned!